Trying to describe the music of Elmore James, someone said the other day, is like trying to describe a primary color. From the late 1930s, when he began his rambles through the American South with Robert Johnson and Rice Miller, until his fatal heart attack in 1963, Elmore James used his voice and a slide guitar to paint lusty narratives with the primary colors of sadness, misery, and doubt. "The sky is crying," he often sang, "look at the tears roll down the street..."
The sky above the Newport Missionary Baptist Church graveyard is graced today with a pale, afternoon moon; a sky that is pleased on this warm and quiet Tuesday in February, carrying gentle winds of an early spring through fields of pine. 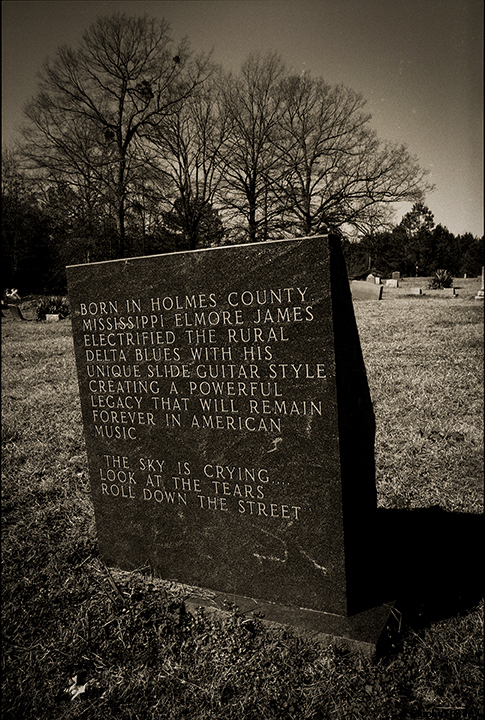 Down below, Elmore James lies in his 30th year of silence. He is here, somewhere in this churchyard of rolling hills and crumbling tombstones off of Highway 17, but I am not sure just where because his grave went unmarked until late last year. Last December, a handsome stone of ebony granite was erected at the cemetery entrance by Elmore's fans. No one is around on this bright afternoon to tell me if the man who could make an electric guitar sound like a tom cat being skinned alive is actually beneath it. 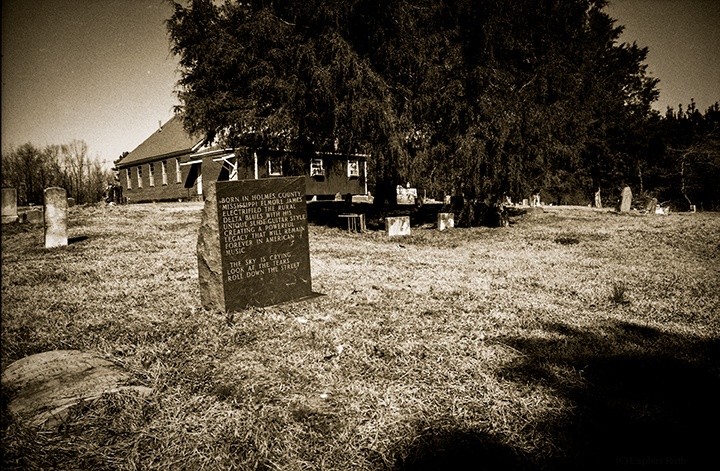 A black pick-up truck rumbles down the gravel road in front of the church, and the driver waves as he goes by. Nothing stirs but the wind until the pick-up comes back the other way and the driver waves again. 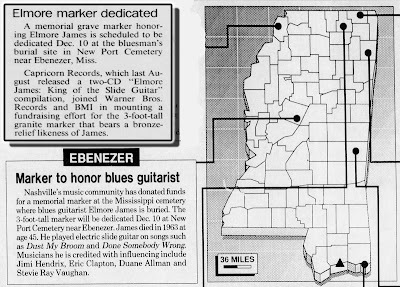 The stone sports a bronze relief of a bespectacled James in suit coat and tie; a small, metal "slide'' tube envelopes his pinky finger as he grips a six-string guitar: Elmore staring out across the quiet Mississippi countryside where he grew up as a farmhand. Because the three-foot-tall monument is so far removed from the rest of the graves (it's the first one you meet, alongside a wooden sign welcoming people to the church), I wondered if the exact location of Elmore's body has been forgotten and they put his marker out front so pilgrims wouldn't miss it. The other graves -- ``Queen Davis, Born 1850, Died Nov. 16, 1918'' and ``Omega Owens, Born July 26, 1908, Died August 11, 1970'' -- are out behind the church, a good 50 yards from the bluesman's headstone. The legacy, which continues today through rock and roll, began on the sly. By the age of 12, already working in the fields, he was making sounds on wire uncoiled from a broom head and strung on the shack wall. Such a blues conviction made for trouble with his parents, who only held to the conviction of the Holy Spirit, and soon he went to live with a more permissive aunt. 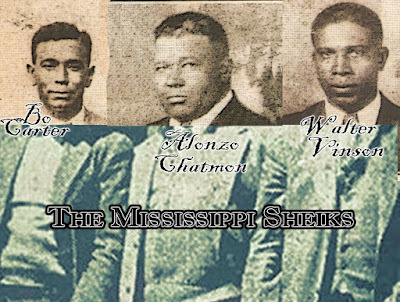 The Jackson (Miss.) Advocate quoted another cousin at the dediction, a woman named Annie Redmond who remembered Elmore making a guitar out of an old coffee can and two wires used to hang clothes. "When my mother saw how determined he was to play the blues, she started throwing house parties to raise money to buy him a guitar,'' Ms. Redmond said. Coming back to the front of the tombstone, I notice that birds have soiled the stone and I retrieve a bottle of glass cleaner and some paper towels from the car and go over the smooth face of the marker like an old Polish lady in Canton getting the streaks out of her front window. After putting the cleaning stuff back in the car, I come back with a tape player and set it in the grass next to the stone. It took me back to a Southside Chicago funeral parlor in May of 1983 when a loudspeaker above an open coffin allowed Muddy Waters to sing at his own funeral. 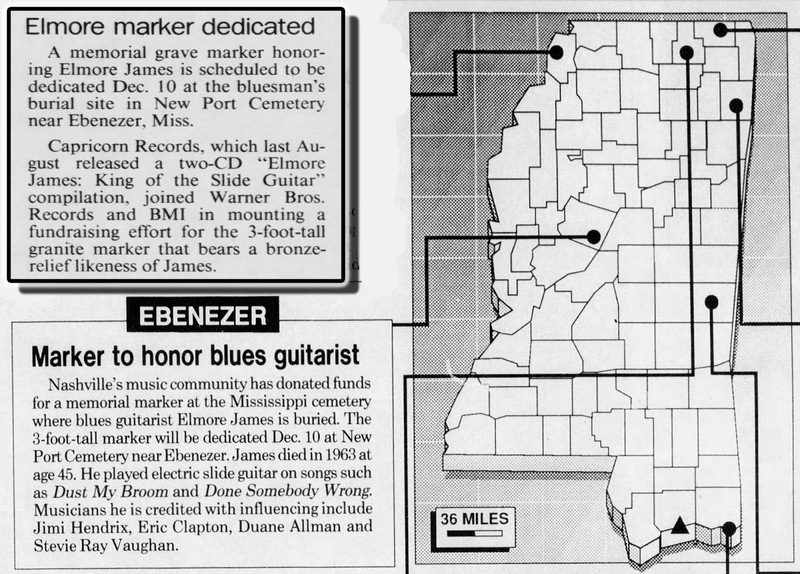 Phil Walden, Capricorn's president, was one of the many who helped raised the cash for Elmore's tombstone. 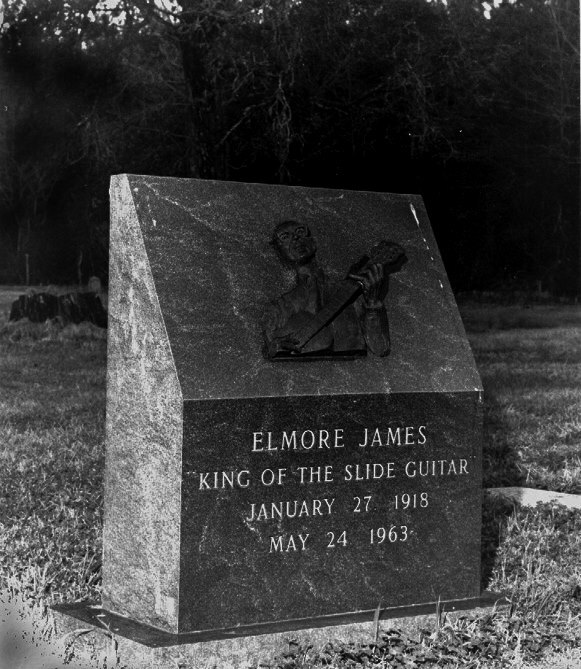 Elmore James died on my fifth birthday -- May 24, 1963 -- nine months before the Beatles appeared on Ed Sullivan and my life changed forever. Those bright boys with bangs led me to the dark thrills of the Rolling Stones who opened the door to Johnny Winter who introduced me to Muddy Waters who carried me to Elmore James and a little graveyard down at the end of Newport Road in Lexington, Mississippi. I wouldn't come to know the voice of Elmore James for another 15 years. No one who loves music should wait so long. The sun is dropping behind the pines and it is time to drive toward it. Rafael Alvarez is a reporter for The Baltimore Sun.